Well I SAY… um… another round, please? 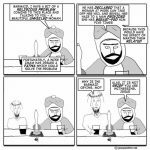 glad to have jesus and mo back regularly. After you’ve created a god in your own image, what else is there to do except put words in its mouth? And why exactly are you surprised that my god wants you to do what I want you to do? Like an old marriage; one knows what he wants to say and the other finishes the sentence (before he says it). After reading Bruce’s comment, I had a very horrible thought. 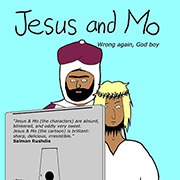 Jesus is the “butch” in the relationship between Jesus & Mo and Mo’s the bearded fat-lady rounding out their freak-show relationship. 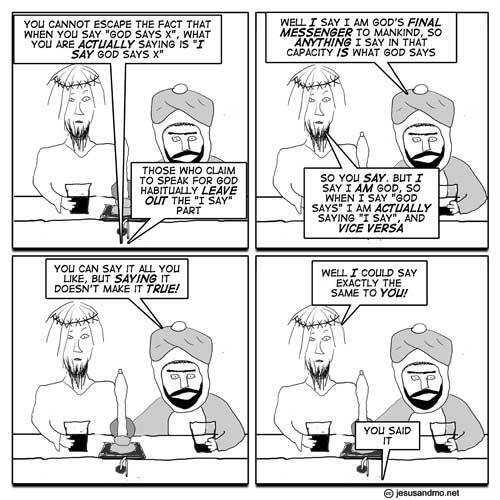 People who say “God says” are simply taking themselves for God’s henchmen! God doesn’t need anyone’s help if he’s omniscient and omnipresent (like people say he says he is)! So what happens in panel 5?! Do they look at each other in horror and then crumble into dust, or what? In respones to carolita’s comment…why would God need henchmen if he’s able to bring down fire and brimstone on someone’s head without just the bat of his eye lashes? Again, this also goes for Alla/Allah in the religion of Islam or Mo, for that matter. If the man (or their God) is able to rip the moon in half (and put it back whole again) then why do they need suicide bombers to do Alla/Allah’s bidding for them to wipe a country (read Israel or any western civilization) off the face of the Earth? All the rest of this is just words. Ophelia, they spontaneously combust: “Pfft.”. Footnote for JohnnieCanuck: speaking of creating stuff, did I forget to mention that it was I who invented weather? Obviously it had to precede forecasting. If you don’t believe this, try living without it. I say that you must not say that! Why hasn’t this specific cartoon been pasted onto every billboard across the free world?